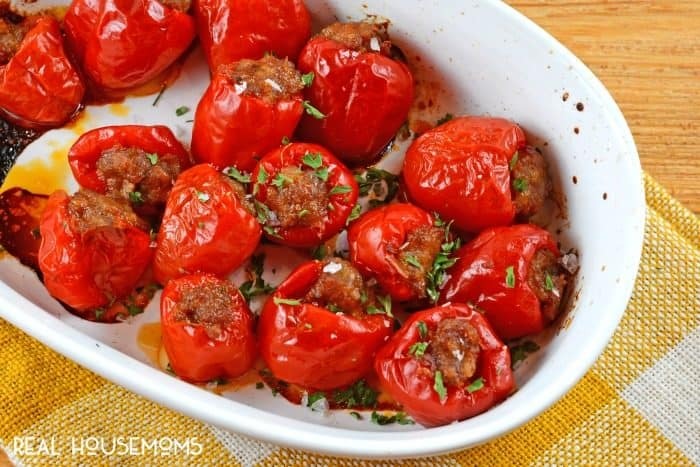 Sausage Stuffed Cherry Peppers are an easy and tasty appetizer that can be prepared ahead of time and popped in the oven ready to serve! Love it? Pin it to your APPETIZER board to SAVE it! No matter what time of year it is, there is always some party, holiday event, BBQ or other function we are attending. Clearly the food blogger can’t show up without a dish, right? My secret weapon are Sausage Stuffed Cherry Peppers. 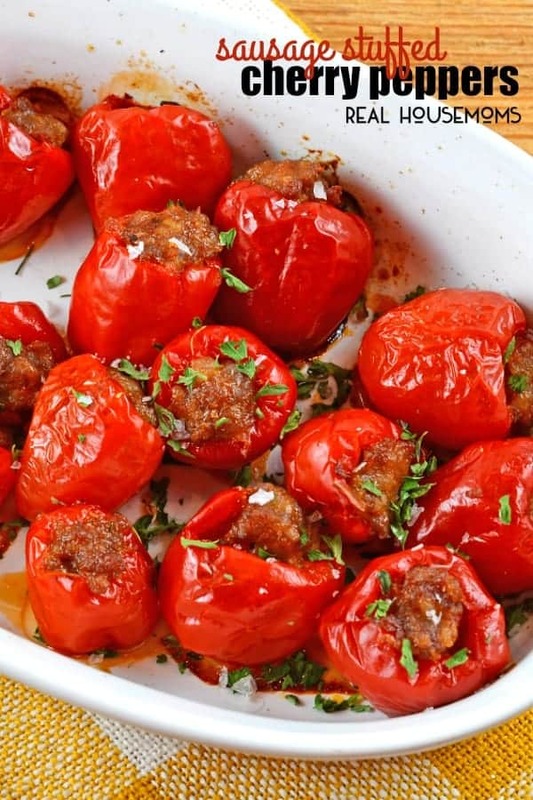 Sausage Stuffed Cherry Peppers are mild peppers hollowed out and filled with a zesty sausage mixture. I like to use spicy Italian sausage, but mild or sweet can be used for those not craving the fire. 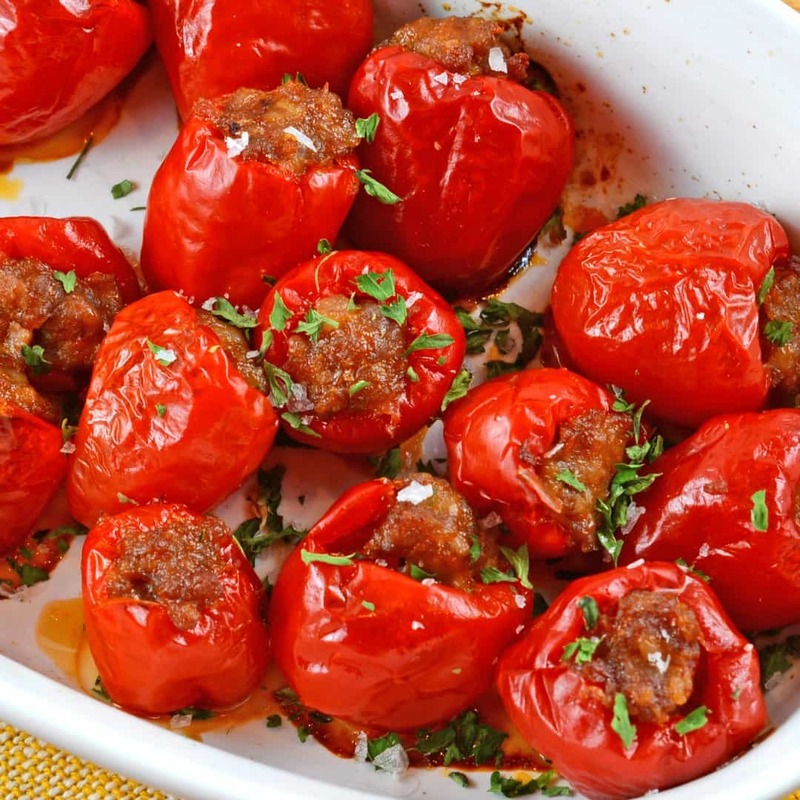 You can even modify sausage stuffed cherry peppers for a brunch and use breakfast sausage, omitting the garlic and Italian seasoning. Such a simple recipe, so many options and variations. Another bonus? I can make them ahead of time. I prep and stuff the peppers up to a day in advance and then cook them right before leaving or at the actual party. So easy! Cherry peppers are also known as peppadews. I personally like to call them peppadews instead, it is just such a fun word! They are commonly found in the “olive bar” or antipasto section of your grocery store. They also come jarred and pickled in the Italian food section near artichokes, olives and roasted red pepper. A 14-ounce jar is the approximate amount needed for this recipe, but sizes and quantities do vary and a few will inevitably be ripped, so plan for a few extra and buy two jars. Any leftovers are perfect in salads or you can make my Peppadew Poppers for an additional appetizer or even a side dish! Preheat oven to 375 degrees and coat a 9x13 baking dish with cooking spray. Using your hands, mix sausage meat and breadcrumbs in a medium bowl. Stuff each pepper with sausage mixture, allowing a little to pop out of the top. Place in prepared baking dish. Roast peppers for 20 minutes or until sausage is cooked through and the pepper skins start to dry out a little. Garnish if chopped fresh parsley, if desired. 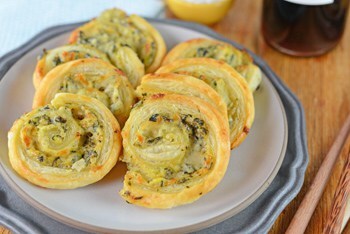 For an even prettier and colorful appetizer tray, also make my Spinach and Artichoke Pinwheels! Nothing says “hostess with the mostess” like a beautifully arranged sampler platter! I'm Jessica, cook, photographer, wife, and mom bringing you on my culinary quest to learn more about being a better home cook. I make gourmet cuisine approachable and believe any dish can be made better with the right salt and bacon.